Over the past week, I've been playing with my 630m transverter summer project. 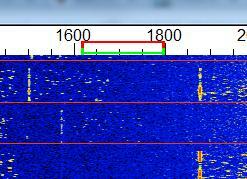 It's not the normal type of transverter that would produce a signal on 630m (~475kHz) but rather, one that will produce a signal on twice this frequency. My630m amplifier, using switching FETs, was designed and built with a 'divide-by-two' input circuit, to allow for greater frequency resolution when first constructed as a 2200m system. I really don't want to modify the transmitter and prefer just to be able to unplug my DDS and plug-in the transverter, allowing me to run WSPR, JT9 and several other digital modes when needed. So far I've not been able to get the transverter to produce the desired low voltage 950kHz squarewave output, although I'm closer than when I began the troubleshooting. My circuit is basically a G3XBM 630m transverter, without the FET final amplifier. Instead, the driver feeds a full-wave rectifier frequency doubler for 630m, designed and published a few years ago by Jay, W1VD. Although I can get a squarewave end result, I think harmonics creeping into the process earlier down the mixing chain are causing non-symmetry in the output. I'm using a 3.200MHz crystal oscillator with low level RF drive from my IC756PROIII transceiver at 3.675MHz feeding an ADE-1 double-balanced mixer in order to utilize the 'difference' frequency, 475kHz. I've tried a 3-section LPF with a cutoff of ~600kHz between the mixer output and the next stage, trying to knock down the 'sum' frequency of 6.875MHz and any crystal harmonics but have since replaced this with a 630m diplexer at the mixer output to pass anything below 1MHz to the squarer and anything above 1.5MHz to ground. I'll keep playing with it ... until it works as it should or I have no hair left to pull out. I may also just rebuild the circuit, Manhattan-style, with normal sized parts, making it much easier to change or modify as I need. The scope grabs shown above are with the diplexer in place at the mixer output. It seems like something in the full-wave frequency doubler is amiss. I've looked at T1, the bifilar transformer several times but don't see anything odd but that's the stage where things seem to go south. Maybe it's an impedance matching-thing, something I'm yet uncomfortable with when it comes to properly matching various stages. I also now realize that the section of transverter I have chosen will require post-mixer filtering, not shown in the schematic. Not using the last stage (FET PA) and its associated filtering, has no doubt caused more harmonics to appear in the output than anticipated. If I redesign and rebuild, I will add an LPF after the crystal oscillator as well as at the RF input port and pay more attention to post-mixer filtering. Another route to try, rather than the W1VD doubler, may be this 4069 IC doubler or a similar 4011 doubler. Although the project outcomes have not yet been achieved, the process has been a positive one in a couple of respects and well worth the time spent so far. I have learned that working with the 1206-sized SMT parts is much easier than suspected and in fact, populating the board with these tiny parts was a lot of fun. The 1206-sized parts are at the 'large' end of the SMT size-spectrum ... rest assured I won't be going any smaller, at least for now. 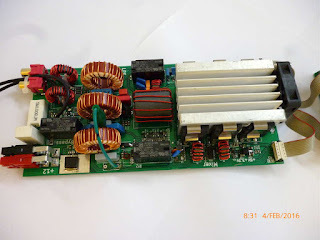 My previous taste of SMT-construction was many years ago, when I built a small 40m QRP transceiver using seventy-two SMT parts ... it was an inexpensive kit from one of the QRP clubs. Happily, it worked with no problems but I found the process tiring and laborious and only soldered a few parts on the board each day until it was completed. 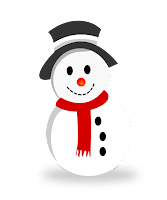 The present experience was the exact opposite as I found it a very enjoyable experience ... I'm really looking forward to doing more SMT construction in the future. The other positive outcome was knowing that my PCB design process can work well with the narrower lines, pads and much smaller IC footprints. I still design my boards using MS Paint and have always been happy with the ease at which it works. I know many might scoff at MS Paint but it really is a very versatile little program, with a short learning curve, unlike many of the more sophisticated PCB design programs. Although I will work with SMT again and, similar to this project, I'll not be concerned about shrinking the board too small, although I'll work towards that goal. My main reason for trying a homebrewed SMT board was to see if I (my eyes) could still handle it and since so many parts are no longer available in the 'normal' size we have been used to for the past several decades ... particularly obvious when trying to source IC's in the good old DIP package. I am seeing a lot of 'obsoletes' pop up for some of my wanted chips, as the larger DIP packages are no longer in as much demand. And one more positive outcome. I used the project as an excuse to purchase a new soldering station ... one that I had been lusting over for a few years as it is very SMT-friendly compared to my old Weller clunker. It also has an electrically isolated tip, unlike my Weller. 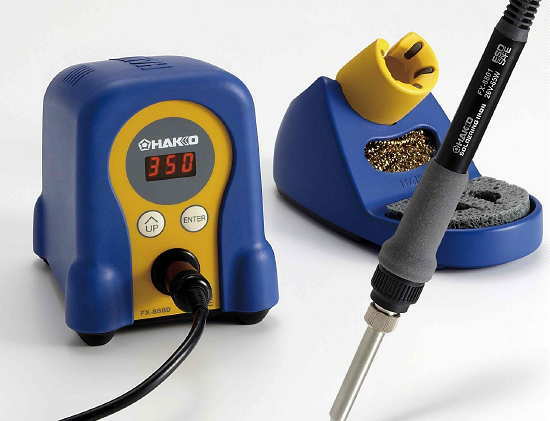 The Hakko FX-888D turned out to be everything I had hoped and was no doubt part of the reason that I found the SMT process so enjoyable. If you haven't tried building with these smaller components, don't be afraid to test the waters. I have no idea how long our 'normal-sized' leaded parts will be readily available but I now know that their eventual demise won't slow me down when it comes to homebrewing. This coming weekend will see another CLE challenge, this time in the MF band from 260 - 269.9 kHz plus 440 - 1740 kHz. 'CLE's' are 'Co-ordinated Listening Events', and NDB DXers around the world focus their listening time on one small slice of the NDB spectrum ... but this time around, the range has been expanded. The lower frequency range covers one my very strong locals, 'VR' on 266 kHz. 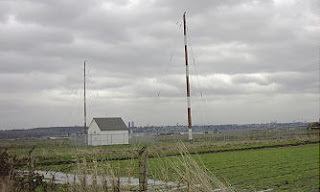 'VR' is an outer marker approach to Vancouver International's 'two-sixes' and is located a few miles east of the main runways in a farmer's field. Although running just 50 watts, it is widely reported (as far east as North Carolina), probably due to the excellent soggy ground beneath its somewhat unusual delta-shaped loop. Our end-of-August Co-ordinated Listening Event will soon be here. and there is also the possibility of hearing several amateur beacons. CLE191 in February 2015 when 45 of us joined in. Europe's Medium Wave Broadcast Stations. BEACON MODE, preferably with normal speed Morse. receive them and make reports). Please look out for my final details with advice about log-making, etc. As mentioned in previous blogs, this summer's Es season on 50MHz has seen a huge increase in the number of stations using the weak-signal JT65 mode. Although this mode has been around for a few years, for some reason, it really took off this season. I witnessed many long-time, 'CW-forever' operators (myself included), gingerly move up the band to see what this mode could offer. At first I thought the activity I was seeing was probably mostly from magic-band regulars, who like me, were also curious ... but I now think this is not the case. Normally, my 6m summertime Es activities result in just one or two stations requesting a QSL to confirm the contact. These are usually guys that either need a VE7 card or are looking to confirm my grid-square ... just a few cards arrive, in spite of many dozens of contacts over the summer months. This summer I noticed a much different pattern. This summer saw a tenfold increase in the number of QSL requests and every single one was for a JT65 or JT9 digital mode contact! It soon became apparent that these were not 6m diehards that had just moved up the band, but rather, very enthusiastic newcomers to the band ... what an exciting thing to see! Many of the cards did not have any grid-square information ... the telltale sign of all VHF operators. They had discovered the magicband, using JT65. Perhaps these were mostly 'no-code' amateurs or those living in antenna-challenged situations such as condos or apartments. Whatever the reason, it really is interesting to see such a profound change in 6m operating tactics, by both the veteran ops and by the newcomers ... all happening so quickly. Hopefully some of the new arrivals will venture down the band to try CW or SSB where contacts can be made much more quickly than on the digital modes but all of this new activity is wonderful to see. Early last week, Paul (K7CW) sent me a link to an interesting video showing the Duga antenna system. The term was not familiar to me but when I went to the site I immediately recalled the significance of what I was seeing! Those of you that have been hams for a long time will no doubt recall the Russian 'Woodpecker'. The 'Woodpecker' was a strong, fast repeating signal / racket that often wiped out amateur communications on 20m here in North America ... maybe other parts of the world as well. Amateurs with yagis eventually determined that the signals (yes there was more than one it seemed) were coming from the USSR. The QRM was persistent and in spite of formal complaints being lodged via diplomatic channels, continued for many years ... from 1978- 1989. Some of the new transceivers built during the time actually had a 'WOODPECKER' position on the noise blanker switch, hopefully offering some relief to the problem. Several web searches brought up numerous descriptions of the Duga (Russian for 'arc' or 'bow') project, some with conflicting information. From what I can sort out, there were three Duga sites ... one near Chernobyl, another near Chernihiv and a third, much later, in Siberia. The first two (Duga and Duga-1) were in the Soviet Ukrainian SSR (now Ukraine) while the third was located near Komsolmosk-on-Amur in the Russian far east. 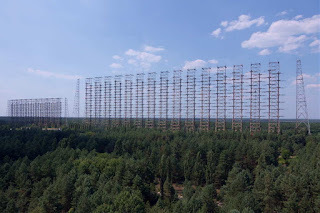 One source indicates that the second Chernobyl site is often misidentified as the Duga-3 array and should be referred to as Duga-1, with Duga-2 being the Siberian location. Initial speculation suggested this intrusive signal was some form of 'jammer' ... very common during the Cold War. 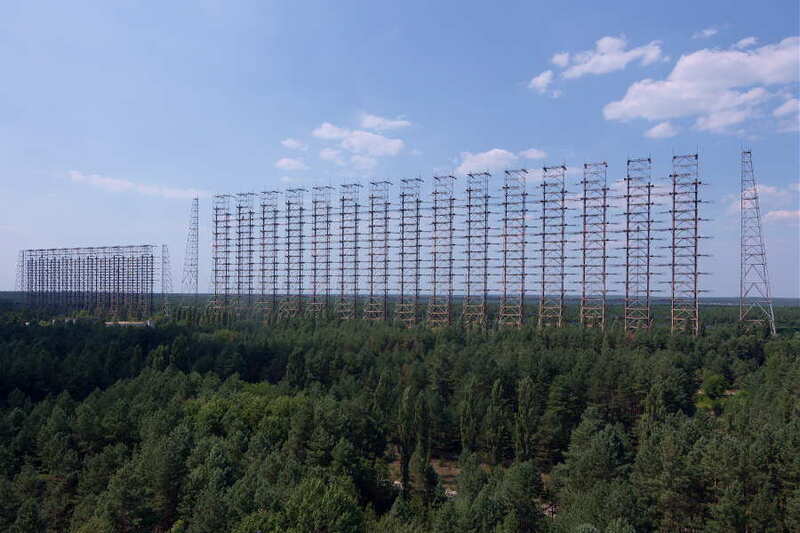 It wasn't long before the true nature of Duga was thought more likely to be an 'over-the-horizon' (OTH) long-range radar system for detecting the launch of North American missiles aimed at the USSR. The three radar sites gave the Soviets good over-the-pole coverage as well as to the east, where it could also be utilized for tracking domestic rocket launches. The antennas themselves appear to be phased dipole curtain arrays, commonly used in various configurations by shortwave HF broadcasters. These antennas featured an array of phased dipoles in front of a screen curtain 'reflector', often made of rows of wide-spaced wires. One source indicates that the Duga arrays developed ~30db gain over a standard half-wave dipole ... an enormous task on these HF frequencies. 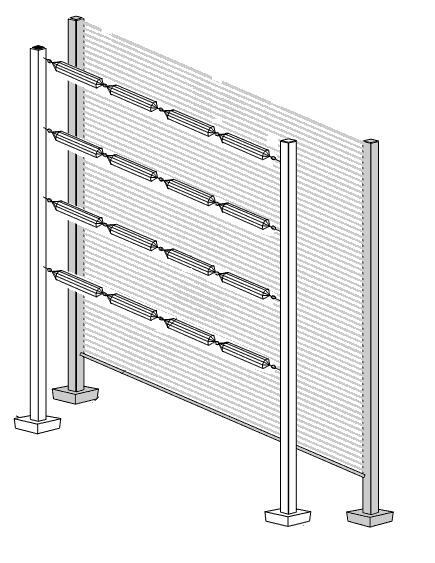 One system had a '4/4/1' configuration meaning each bay consisted of a dipole array 4 wide and 4 high. Another source spoke of a system that was 32 high and 16 wide in total. Whatever the numbers, these free-standing structures were gigantic and true marvels of engineering. The large Chernobyl array is 150m high and 500m wide, with an estimated weight of ~ 14,000 tons. Each site was paired with a receiving array ... remember, this was a radar system, with two of the three systems having the receiving array located tens of kilometers from the transmitter. 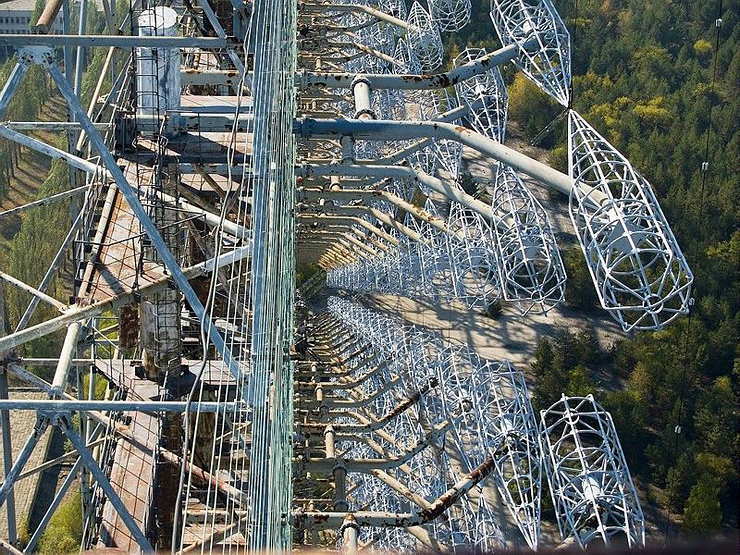 The Chernobyl Duga is said to have had the receiving antenna located on site. Sources discussing physical size indicate the dimensions for the receiving array to be larger than those of the transmitting antenna. It seems possible then, that the pictures and videos commonly found are those of the receiving array and not of the transmitting antenna. It might make sense to have more gain on 'receive' than on 'transmit' as echoes from small targets many thousands of miles away would not be easy to detect. No matter what the actual case, I can only imagine the fun of hooking up an HF transceiver to one of these arrays during a DX contest on 20m CW! The Chernobyl site shows two arrays, side-by-side ... possibly the larger being that used for receiving and the smaller one for transmitting. This antenna has been noted as a 30/10/2 array ... 2 bays, 30 dipoles wide and 10 high, 600 elements in all! 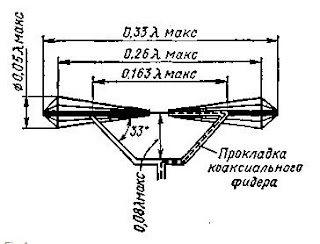 Further research tends to indicate that each dipole is what is called a 'Nadanenko' dipole. The main feature of this style was its cage-styled construction, giving the element a large diameter resulting in a broad bandwidth. Each dipole was fed at the center with open-wire ladder line and some pictures show obvious signs of open wire phasing lines, no doubt used to electrically steer the array over its reported 30 degree directional pattern. After watching the video, Paul (K7CW) made some interesting observations, some of which may be seen in the above photograph. His eyes must also be a lot better than mine as he managed to correctly count the number of dipoles in the array! First, you see that there are two sets of arrays 15 driven elements wide by 10 driven elements high for a total of 600 elements! They are intermeshed and offset from each other by 1/2 wavelength both vertically and horizontally. There is a horizontal wire screen reflector behind the driven elements. ... you can see the open-wire feeds and reflector screen. Each set of collinear elements is fed individually with open wire line. There is a support line between each two bays of driven elements. ... that the element supports are steel pipe instead of fiberglass (or something similar). Apparently, the shape of the radiators allows for the pipe supports to enter the element cages at the element low-impedance point which made the supports invisible to the antenna and also allowed for the supports to not radiate themselves. 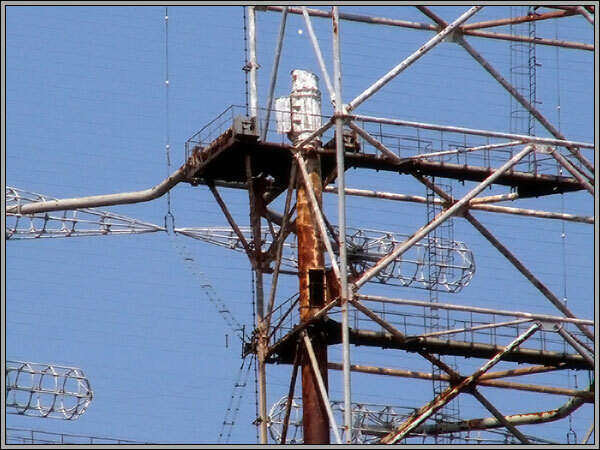 There are a number of YouTube videos showing various adventure-seekers climbing the Duga array near Chernobyl. 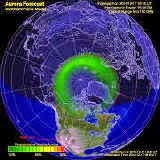 The videos give you a better idea of its sheer mass as well as a closer look at the dipole structures themselves. The Duga system was operative between 7 and 19MHz, with 40kHz wide pulses, usually lasting for about seven minutes. The most common pulse rate was at ~10Hz but this sometimes varied. Power levels used often mention 10 megawatts but it's not clear if this was RF output, peak pulse power or ERP. It's somewhat gratifying after all these years, to actually see close-up, where the Woodpecker signal started its journey around the world and to appreciate the superb engineering that went into these impressive structures ... but sad to see the last one in such a rusted state of decay and abandonment. It would be nice to hear it just one more time ... but please, only for a couple of minutes. For the past several months I have been beaconing overnight on 630m WSPR mode. I've been using a new transverter designed by Roger Croft (VK4YB) and Ralph Loveday, in Queensland, Australia. One unit was sent to me for beta testing and I have been hammering it as hard as I can ever since setting it up in the spring ... no problems have been experienced after several months of 12 hour nightly beaconing punishment. Nightly signal reports often range from Hawaii / Alaska and eastward to New England ... all during the 'not so good' summer band conditions. Now that beta testing is complete, production units are now ready for distribution from Monitor Sensors, a family environmental-sensor manufacturing company of which Roger is Governing Director. 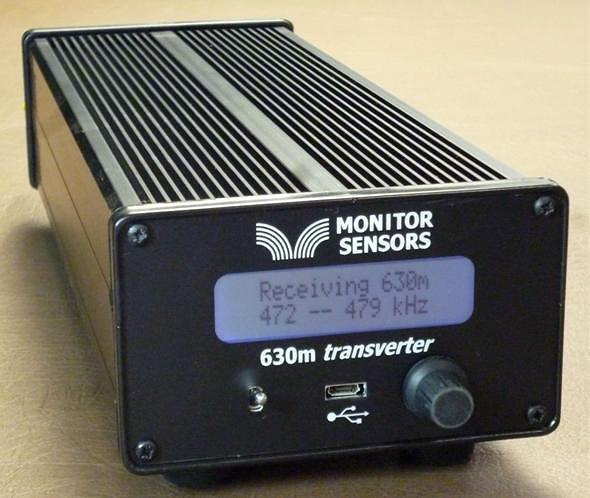 The introduction of the VK4YB 630m Transverter presents another new option for those wishing to get on the band, or in the case of American amateurs, to get prepared for the band ... soon expected to be implemented in the U.S. When I first started using the test unit provided, I was immediately impressed with how simple it was to set up and to get operational. It sits inconspicuously beside the main station's transceiver, taking up less space than the typical station speaker unit. One usually associates 'transverter' operation with a rat's-nest of cabling or re-cabling to accommodate the new addition. 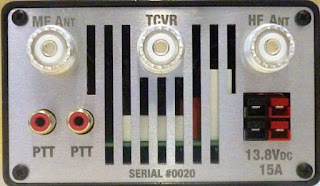 The transverter arrived with all necessary cabling, even a nice Anderson power pole connector to connect the user-supplied 12V power source. A second pair of 12V contacts is also available for sharing with other station needs. One feature that I quickly appreciated was the dual RCA jack on the rear panel for controlling the transverter's PTT keying line. With my transceiver's PTT line already being used for another purpose, it was simply a matter of plugging-in (cable supplied) and sharing the line with the second jack ... no need for unplugging or using an external adapter to split the PTT line. Switching from 630m to normal HF operation is simply a matter of turning the transverter 'off' ... all HF operations are back to normal with antenna routing taken care of. There appears to be a lot of thoughtful engineering packed into this little box. A look under the hood shows a well-planned and efficient use of space as seen in this pre-production prototype shown below. If Collins Radio were to manufacture a 630m transverter for the military, I can't imagine it being any better than this! Although rated at 50W output, my transverter produces ~ 70W output when run at 12.6 volts. More output can be realized at higher voltage, up to as much as 16 volts. Power is generated with six carefully-matched Lateral MOSFETS, three aside, in a parallel / push-pull configuration. "... we carefully match the FETs into three pairs. Each pair is matched to its opposite number but the pairs are chosen so 2 have low gain, 2 have mid gain and 2 have high gain. This improves the IPs and also the harmonics. With matched FETs we are getting the 2nd harmonic at typically -60dB. That's 10dB better than the stringent FCC requirement." Roger's unit is running at 16 volts and produces 90W output, with his 630m WSPR signal being the one most often heard in North America from down under. The transverter's multi-colored screen combines with a multi-function menu, allowing a visual on-screen display of numerous parameters such as RF output power, DC supply voltage and current draw, SWR, exciter drive power, heatsink temperature, graphic SWR display and various warning screens. The transverter requires 3-5 watts of 160m drive from the station transceiver for full output power. Built-in safety circuits prevent overdrive from causing any damage. Similarly, transmitting into a high SWR or with no antenna connected is no cause for concern. Temperature sensors will trigger shutdown should the heatsink rise above 100 degrees C. Software also prevents out-of-band transmission. This is a microprocessor controlled linear-transverter. This means that operating system software can be readily updated (via the supplied micro USB cable) as new features are implemented. 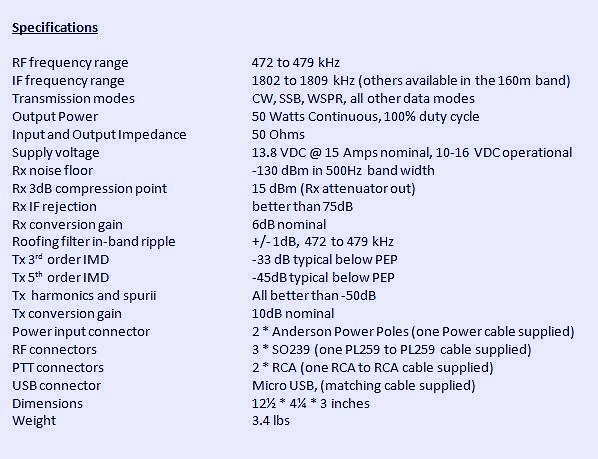 It also means that any mode your transceiver is capable of operating on can be produced on 630m. At present, the most popular modes on the band are WSPR, CW and JT9 but I suspect this order may change once the band is opened up in the U.S.
A shortened eight-page Operator's Manual can be downloaded from the Monitor Sensors web site but units will ship with a more comprehensive 22-page manual. For more information regarding pricing and shipping, please contact Monitor Sensors here. For technical questions, please contact Roger here. 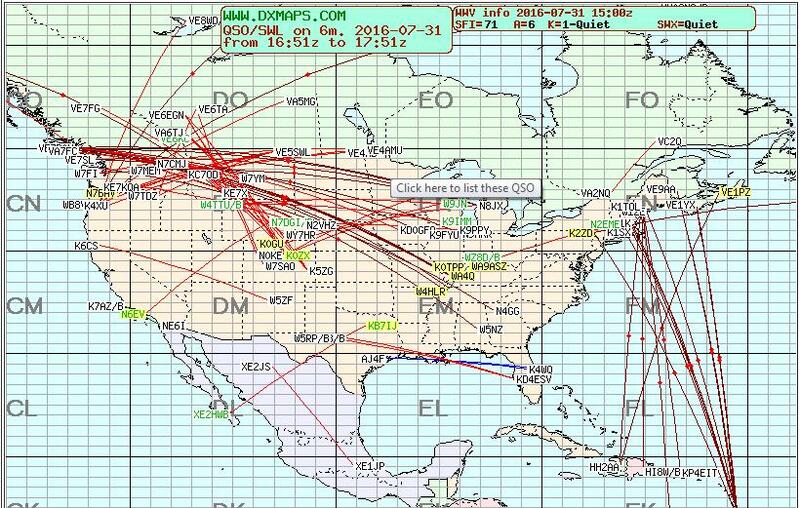 Thursday's blog lamenting this summer's poor domestic Sporadic-E season on 6m must have struck a sour note with the propagation gods as Saturday afternoon and evening saw a massive opening to the eastern U.S., Alaska as well as to the Canadian Arctic ... it was even strong enough to show up the next morning and continue on and off for most of the day. Now that's the type of thing we used to see with fair regularity and it was a welcome respite from what has generally been acknowledged, along with last summer, as the poorest Es seasons in many years. The long-lasting, strong-signal opening provided us dedicated 6m junkies with a nice late season flurry of fun, which would not have been out of place had it occurred in mid-June ... maybe the Es 'metamorphosis' eluded to in my last blog also includes an extension of the normal season. Who knows what effect global warming is having on this aspect of natural phenomenon ... there is just not enough yet known about this fascinating mode of propagation that generates so much interest every summer. The map below shows the 'leftover' activity on Sunday morning ... not as much as Saturday night but still a pretty good showing for the last day of July! I spent most of my time working this opening on JT65, up at 50.276, and learning the ropes of this fast-growing mode. One thing is abundantly clear however ... ideally, the chosen JT mode for 6m Es should be JT9 and not JT65. Using JT9 would allow 10 times the number of stations to fit into the present JT-window ... that's 100 JT9 stations instead of 10! With JT65, the window fills-up quickly and the QRM can soon take its toll with the usual ear-splitting strength of Es signals.The waterfall below shows the much narrower, more sensitive JT9 mode on the right compared with the wider JT65 signal on the left. 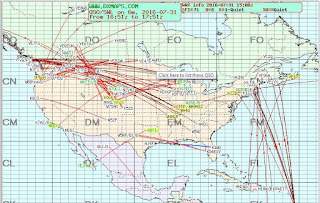 I took the opportunity to send out a few JT9 CQ's and did work a number of stations with several of them being well into the -20db range ... too weak for CW but readily worked on JT9. The sensitivity of JT9 will allow two-way contacts to be completed right down to the -27db range, over a one minute transmission period. This is pretty close to the popular WSPR none-QSO mode! I'm surprised that WSPR is so popular on HF when hams could actually be working each other, on-the-air in weak-signal mode JT, instead of relying on a backdoor computer link to see who is hearing their signals ... isn't two-way communication what it's all about? Granted, WSPR beaconing is great for observing propagation trends when you can't be there to watch, and therein lies its utility. Please excuse my short WSJT rant! Saturday night's opening provided another rare visit from the 6m 'snowman' ... VYØSNO/b, located in Iqaluit, Nunavut in the Canadian Arctic. The beacon is rarely heard as far west as VE7 and it is always a great treat to catch it. It is basically unmaintained so when it fails, may never be repaired ... it's nice to know that its 25 W transmitter is still doing the job. I suspect that if anything fails, it will be the antenna in the brutal Arctic winter weather. 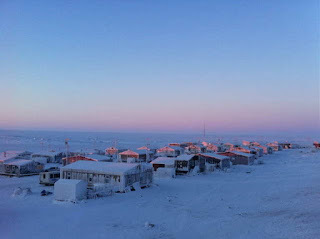 The beacon's vertical antenna is located on the top of the high building on the left. A little later in the evening, an even rarer beacon made a 599 appearance as well ... VYØYHK/b, located on King William Island, Gjoa Haven, Nunavut. It was pure magic to hear its little 15W transmitter, complete with Arctic 'flutter', pounding into the west coast from above the Arctic Circle. This short video was made during Saturday evening's opening to the north and before the VYØYHK/b appeared. 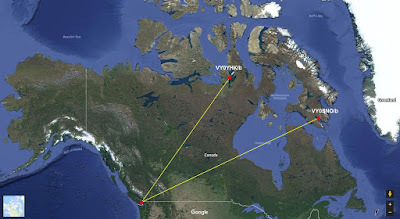 The weaker beacon on 50.030 is VY1DX in Whitehorse, Yukon Territory. This morning, as I write this, the band is open to W1 and points to the east ... still some life left in the band yet. It will be interesting to watch what happens over the next two weeks, when most Es activity on 6m usually folds its tent and quietly disappears until the following May ... let's hope the Fat Lady still needs more practice before pulling the curtain.